As one of the leading specialist business relocation services in the North of England, McCarthy’s Business Moving & Storage is your guarantee of getting the job done seamlessly – on brief, on budget and most importantly, on time. 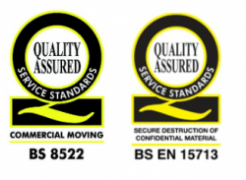 We are proud to be one of the first companies in the UK to be awarded the prestigious BS:8522 British Standards for Business Moving and Storage, as well as being proud members of the British Association of Removers commercial moving group CMG. We understand and take into consideration the issues that arise throughout the removal and relocation process; the need for meticulous planning, careful management and clear communications with our clients and their staff. Moving your business is a time of change for both your staff and your customers and it can easily become stressful and disruptive! If you want to be able to maintain communication with your customers throughout the moving process whilst also keeping your staff motivated and working, come to McCarthy’s Business Moving and Storage. It is likely that your company is operating in a highly competitive marketplace where you can ill afford any disruption or downtime to your business. We understand this and how important it is to move your business efficiently, keeping the disturbance to a minimum. On this basis you should expect your relocation services provider to have a proven track record of meeting its commitments and applying the most exacting standards of service to its workmanship; qualities of which McCarthy’s is proud to offer our clients. At every level, McCarthy’s of Leeds work as a team, but with a dedicated point of contact for our clients. Our Top 10 Tips for moving business premises will also ensure you have a smooth move. We regard good communication and a sound working relationship as essential to a successful relocation. Our efficient operating is achieved through proven project management systems and our ability to expect the unexpected! This enables us to prevent problems arising which may adversely affect your move and this flexible, experienced approach is often the secret to success. For complete peace of mind and a name you can trust, call McCarthy’s today on 0113 262 3000.